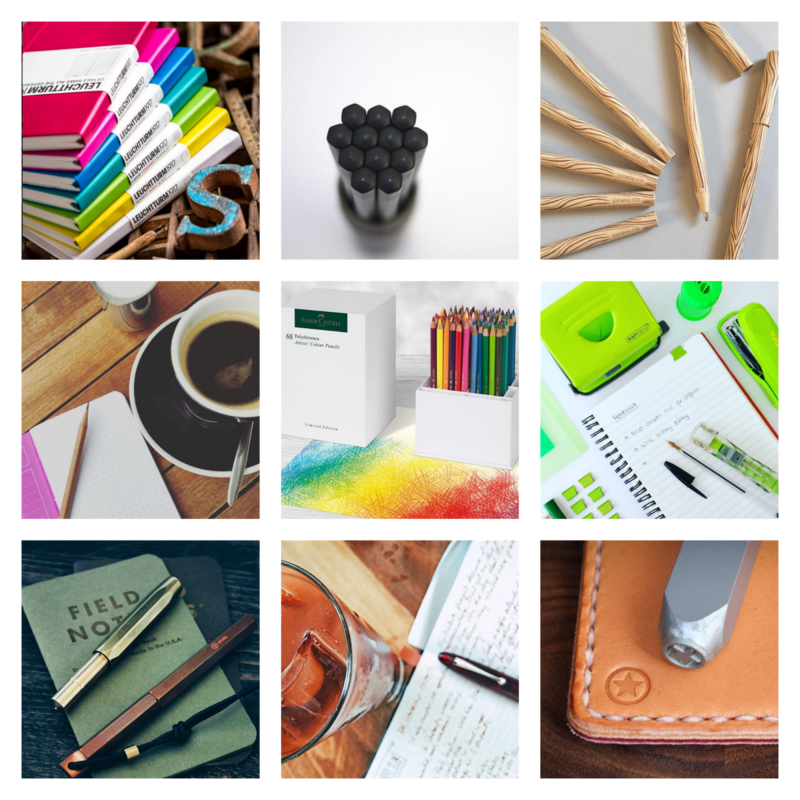 As a blogger, National Stationery Week may very well be my most favourite week in the year. It's at this time of year that I get free rein on talking about stationery (not that it's ever stopped me before...) and it's the perfect opportunity for me to recommend my favourite stationery items. I'll be updating this blog post each evening this week in line with the themes from National Stationery Week (I've included them below so you can join in too if you like) and talking about how and why I love stationery so much. Writing implements are always a tough one for me. I mean, I'm a sucker for a nice pen - even one engraved with my name - but the pen has to be heavy and I prefer a thick barrel due to the way in which I hold my pen (resting on my ring finger, rather than my middle finger). I like a 'wet' ink rather than basic biro ink so any notebooks I use have to be able to accommodate that without bleed though. Pencils are another ball game all together. I used to only write in pencil, especially in my diary, so that the perfectionist in me could erase any errors and keep a tidy planner. Since I discovered Frixion pens I've rarely used pencil unless it's a mechanical pencil (yes, I'm aware I've just evicted myself from the pencil community but needs must). I've chosen to share my three favourite pens with you here. They are (from L to R) a Monteverde Prima Rollerball from Pen Chalet - perfection as described above and the design on the barrel is absolutely unique due to the marbling effect used when making the pen. Next is a Parker Urban Rollerball from Pen Heaven which has a narrower barrel but is weighted well - a great every day pen to keep in my handbag. Finally I have the Cross Tech3+ Multifunction Pen from Pen Heaven which is for use in my daily planner or Filofax as it has three refils which can be accessed by a twist of the barrel; a blue biro ink, a red biro ink and a mechanical pencil. I used to be very crafty (no... not in that sense of the word - well, yes I am was but now isn't the time or the place) but I find that there's not enough hours in the day. All I do these days is crochet. Recently, however, I did teach myself how to make an origami box. I have the written instructions available here with images and a video tutorial. It's really simple so you can learn how to do this right now - it'll take five minutes, I promise - plus it's a great way to use up old magazines and scraps of paper! Have some fun with it, be experimental and let me know how you get on! I really wasn't sure what I was going to write about for World Stationery Day but I thought I'd share my 9 current favourite stationery-themed Instagram accounts. I've tried to steer clear of brands but there's a couple in there who really do great Instagram. Give them all a follow and find other new accounts through the recommendations too. I'd also love to hear which stationery Instagram accounts you follow too. 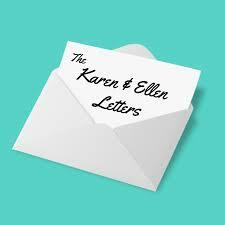 When was the last time you wrote a "thank you letter"? I've been lucky enough to sample a few stationery boxes recently and have noticed a resurgence of notelets and postcards. 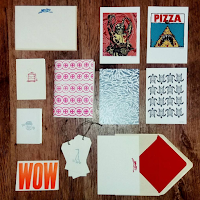 Some are cute, some are classic, some even display up and coming artists' work - but all encourage you to scribble a note to a friend and are the perfect way to send a retro "thank you" to a relative for a birthday gift or even just to ask how they are. 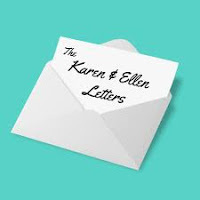 As an aside, I'm listening to a podcast at the moment called "The Karen and Ellen Letters" which is about two fresh-out-of-school teenagers in the 1980s embarking on their first experience in the real world. In the podcast, a year's worth of written correspondence between the two girls and their landlord is read out and then analysed. It sounds odd but, trust me, it's genius. Listen or download here! 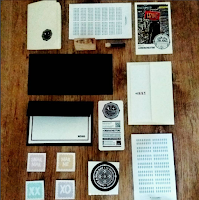 Any stationery addict will tell you that they are a fan of their fountain pen however they only use them if they find an accompanying notebook that is the right size, has the perfect page markings and - most importantly - has paper that is weighted heavy enough to not allow bleed through. A combination which is few and far between, I've found. I have a Kaweco Sport Skyline (in Mint) as my everyday fountain pen and I use either green or purple ink in it. I use it specifically for writing in my bullet journal and for birthday cards and handwritten notes however I tend not to use it for scribbled notes or in my work notebook. You can read more about my favourite fountain pens here. There are about five people in the world know what this is. I can't tell you who, how or why at the moment as I need the accompanying video evidence and a whole blog post to rave about it. 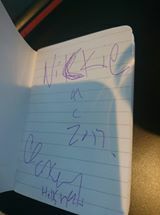 But it IS safe to say that to know that this autograph - and a personal message - is on its way to me is a total fangirl moment. More will be revealed very soon. Let me know if you recognise the handwriting or the signature.... EEK!! Want to read new posts by email?